We have booked a provisional delivery date as per your requirements, if this delivery date is NOT convenient then please call us (01283 743990) within 12 hours to re-arrange. 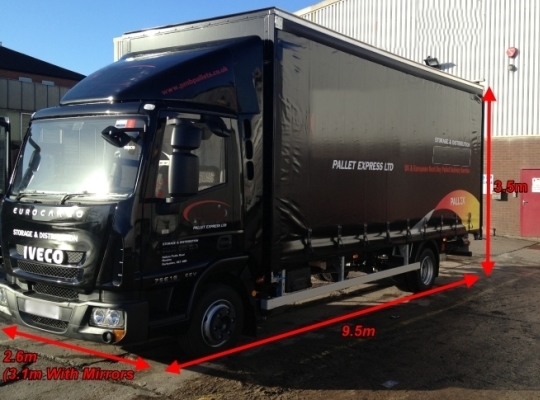 We also need you to confirm that there is access for a 17 tonne delivery vehicle (13m approximate length of vehicle, see photo opposite for an indication of size) with a tail-lift and a pallet truck for moving the tiles and that the area being delivered to is a level, flat surface. If you can only be reached by sharp bends, narrow carriageways etc. we request that you inform us when ordering, as alternative arrangements may be possible to get the goods to you on a smaller vehicle (not available in all areas). Our deliveries are an economy CURBSIDE ONLY service and are usually 3 working days from placement of your order if made before 1pm Monday to Friday. Confirmed orders placed with us before 1pm Monday to Friday are usually despatched same day (stock depending). Confirmed orders placed after 1pm Monday to Friday will usually be despatched from us the next available working day. Orders placed on weekend or Bank Holidays will be processed on the next working day. Available at extra cost is the Next Day delivery slot, this is only available to certain post code areas. Your order will be delivered Monday-Friday between 8.30am-5.30pm. Due to the specialist nature of these items these require specific transport arrangements. Prices for shipping should be obtained by clicking the Enquire About This Product button on each product description or contact our sales team. Unfortunately we are unable to provide estimated times for the day of delivery and therefore ask that there is somebody available on site to sign for the goods. In the event that there are damages on delivery, please sign the delivery note as 'DAMAGED' and call within 24 hours (or next available business day) to let us know so that we may arrange replacements or discuss an alternative resolution, photographic evidence of breakages will be required. We will require a contact telephone number which will only be used if the courier has a problem locating your address or if you require a phone call an hour prior to making the delivery. If the driver is unable to unload the goods at your property or site, then your crate(s) will be returned to the nearest depot where you will have to make other arrangements for delivery at your expense. All of our deliveries are curbside only. The goods will be delivered to the nearest and safest point to your property so please ensure that there is sufficient man power on site to move the tiles should this be necessary. It is not the responsibility of the driver to do this for you. Due to the weight of the crates they cannot be moved on gravel drives, mud etc. - only on hard surfaces. Every effort will be made to contact you if there should be any delays to your delivery; however as orders are all sent via a Pallet Network, this is not always possible. Due to the delivery schedule being between 8.30-5.30 it is not advisable to book any contractors or tilers for the actual delivery date. We will not be held responsible for any costs involved should trades people be booked and your delivery delayed. The tiles will be banded together using banding tape for stability during transit; care should be taken when cutting the tape as the tiles may move suddenly, slate and stone are heavy products so caution should be taken when lifting, particularly with larger tiles that may require more people or mechanical assistance to unload or move. Our deliveries are provided by third-party carriers - most deliveries use the 17 tonne lorries but smaller vehicles can be used for drops in restricted access locations. 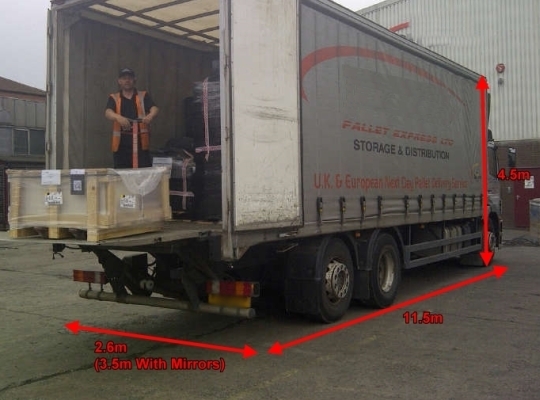 Just tell us before despatch is confirmed if a smaller vehicle is required. We charge by the weight of the order and the destination. Select your delivery postcode from the list available. Our full pallets will carry up to 1,000kg each but this is determined by how many stone tiles can actually fit in the pallet so we also do a half pallet (up to 500kg) and a quarter pallet (up to 250kg) - so an order that weighs 1,100kg would take 1 full and 1 quarter pallet, but if the tiles take up more room, the order may have to use 1 full pallet and 1 half pallet to safely get your order to you. Customers are welcome to arrange pick up of their orders direct from the warehouse during normal office hours (Monday to Friday) either themselves or by arranging their own transport. If you do plan to pick up your order, please bear in mind the total weight can require more sturdy transport than a normal van such as a Transit and you will of course need to arrange lifting equipment at the other end once you've collected your order from us. Please ensure that you contact us (email or 01283 734990 during normal office hours only) prior to collecting your order so we can ensure that it is ready for you in the warehouse. Directions and a map of our location in Marchington can be found here.